Offering you a complete choice of products which include non asbestos brake liner tape. Our organization is among the reputed names in the industry for supplying and distributing Asbestos Woven. The offered tape has earned us a huge clientele and loads of appreciation. This tape is used in industrial band brakes, clutches, industrial drum brakes and automotive drum brakes for providing sealing and insulation against heating and vibrations. 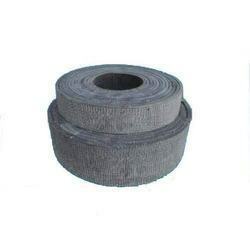 Looking for Asbestos Woven Tape ?